President Donald Trump is cracking down on China’s “economic aggression” via upcoming tariffs and will next move to prevent China from controlling the “industries of the future,” a senior White House official said. 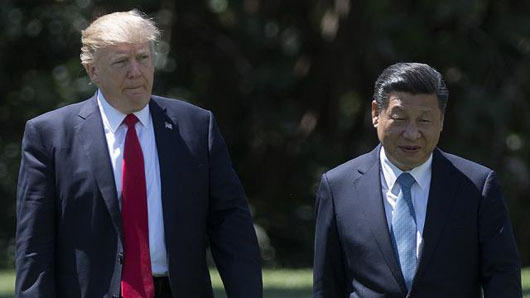 “The next action on the president’s plate will be the Section 301 action which is designed, in a laser beam way, to address the issue of forced technology transfer, theft of intellectual property, and China’s bid through the China 2025 architecture plan to capture the emerging industries of the future,” the senior said in March 12 interview with Washington Free Beacon correspondent Bill Gertz. The new White House National Security Strategy “basically acknowledged that our trade with China was not peaceful engagement, but rather that China was engaged in strategies of economic aggression designed to capture global markets, protect their own market, acquire intellectual property and IP of the world, dominate traditional manufacturing industries, and to a large extent take control of a lot of core natural resources of the world,” the senior official said. In August 2017, Trump ordered U.S. Trade Representative (USTR) Robert Lighthizer to conduct the Section 301 investigation, a provision of the 1974 Trade Act that gives the president broad authority to punish foreign governments for stealing technology and other practices that harm American businesses. “China is a very bad actor when it comes to trade practices across a lot of things, but nothing’s more important in the near term than addressing the theft of our intellectual property and the forced technology transfer of our technologies,” White House National Trade Council Director Peter Navarro said on Fox Business Network. The U.S. is considering the imposition of sanctions or tariffs on more than 100 Chinese products. The action also could restrict China from buying or making large investments in U.S. businesses. “Thefts of trade secrets for the benefit of Chinese companies have occurred both within China and outside of China,” the report said.